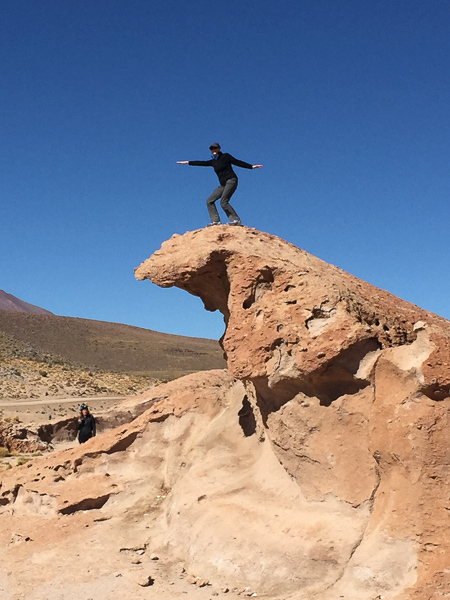 A Pinch of Salt Part Two: Road Tripping the Salar de Uyuni — 2checkingout | travel and adventure | Inspiring. Capturing. Experiencing. On our exit from Argentina, we added to the national debt. Julie ordered two hot chocolates at the bus station. It was only when they arrived that we realised that we didn't have enough money to pay for them. A sad pathetic look from me saw the waiter shrug his shoulders and walk away shaking his head. 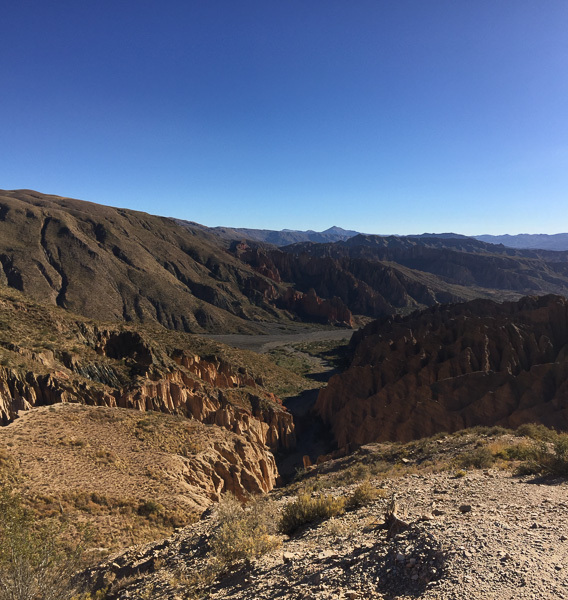 We promise to go back and settle up the next time we are in Salta. 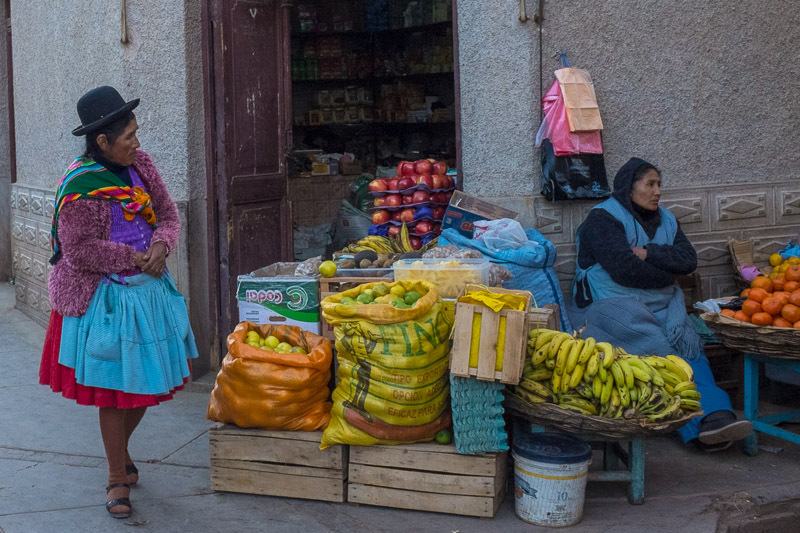 Our overnight bus delivered us to border crossing town of Quiaca at an ungodly hour. The small bus station overflowing with folks waiting for the crossing to open. We presumed it was locals hiding away under the blankets. Did we mention it was blooming freezing? At the first hint of a daylight, the blankets started to stir. A group of local women made their way out of the station. Not being 100% sure where the border crossing was we followed a short distance behind. All appeared to be going well until the ladies veered off road down a small river bank. 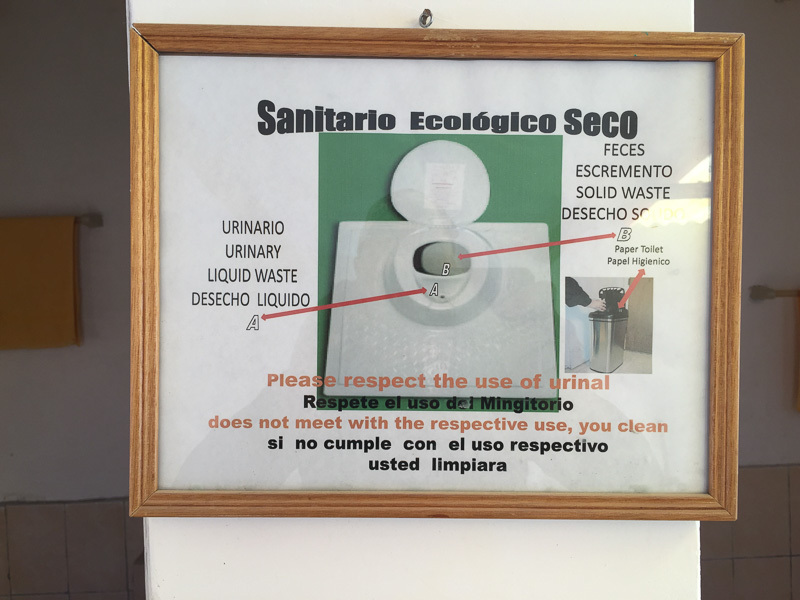 This, we found out was the back door into Bolivia. We needed the front door. After some excellent Spanish from Julie, we found ourselves waiting in line to be stamped into our fourth South American country. 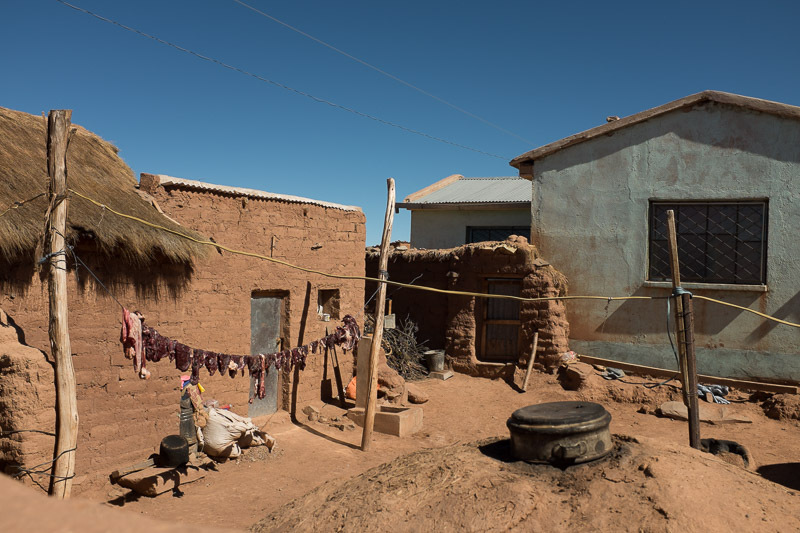 Villazon is the small Bolivian border town. Instead of faffing around with the local buses we decided to take a taxi to Tupiza. After some brilliant negotiation in which two taxi drivers shared nods and winks, we were whisked away to the nearest cash machine. The taxi ride took an hour, with no heating. Thankfully though we had found a driver who didn't have a burning desire to be the next Lewis Hamilton. 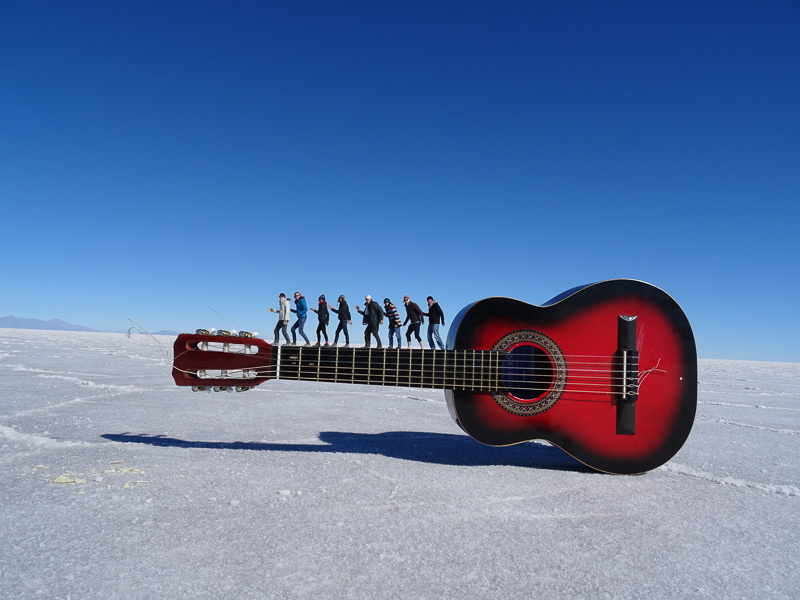 Tupiza is a small town at one end of the salt flat tour (Salar de Uyuni). 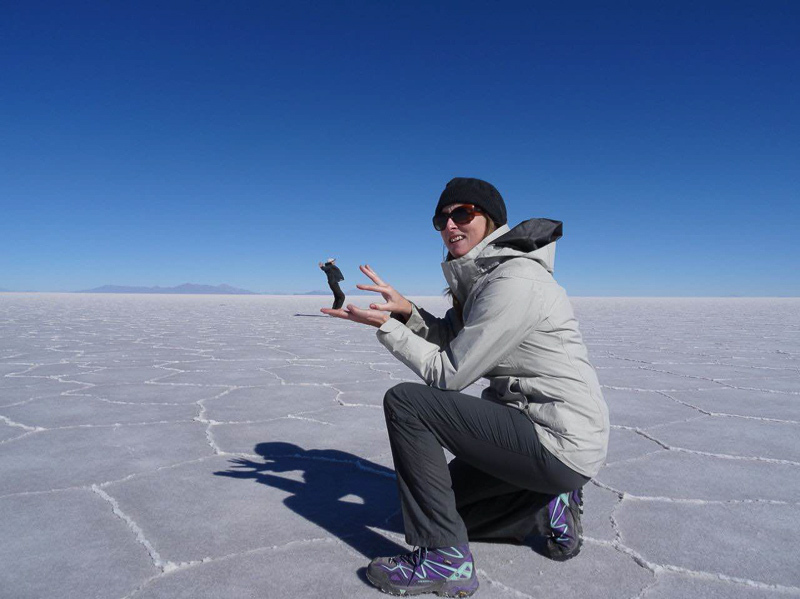 Most people tend to start at Uyuni and work their way to Tupiza. We had chosen to tackle it the other way round, saving the best until last. Eagerly awaiting a sleep in a nice warm cosy bed after a less than comfortable bus ride we checked into Hotel La Torre. Not saying our room was cold, but it could have doubled as meat store. Not sure why the bedroom window had been left open on what was the coldest day in history. The receptionist had a great giggle when I went and asked for a heater. What heaters! As we headed out in search of some lunch we met Trush. Originally from the UK but now living in Auckland, sound familiar? We ate at one of the half dozen identical Italian restaurants. Travelling alone Trush had some great stories to share. Trush was also doing the same tour as us but leaving a day earlier. 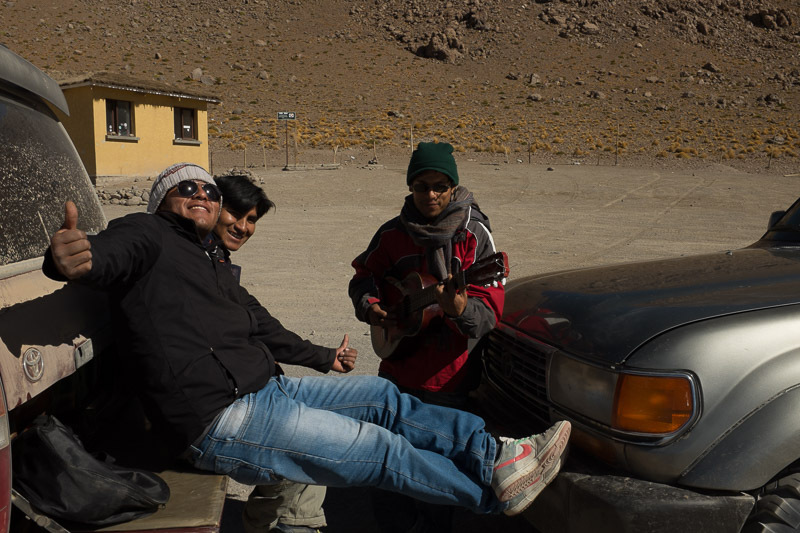 Our paths would cross again in Bolivia. After lunch, we wandered this gorgeous town dipping in and out of the market stalls. Adding to the local ambience the locals ladies were dressed in traditional outfits. 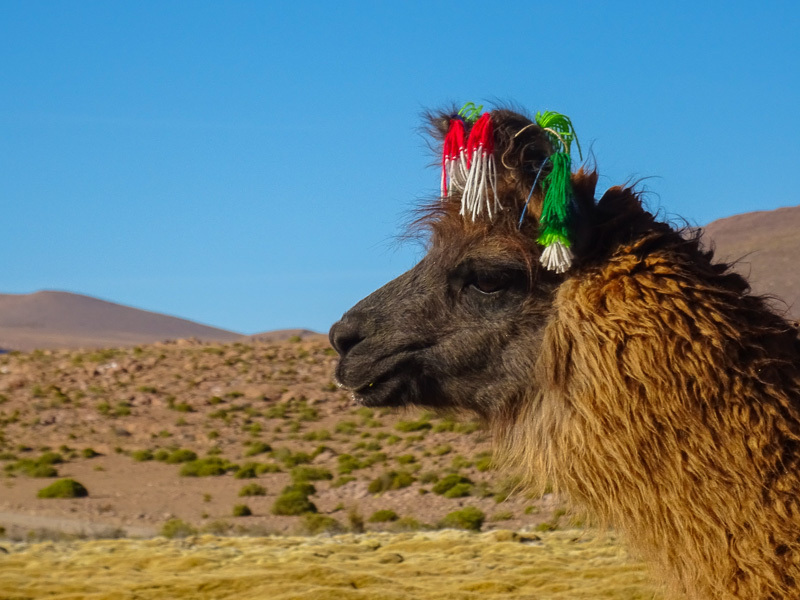 We found a store where purchases of much need llama gloves, scarves and jumpers were had. 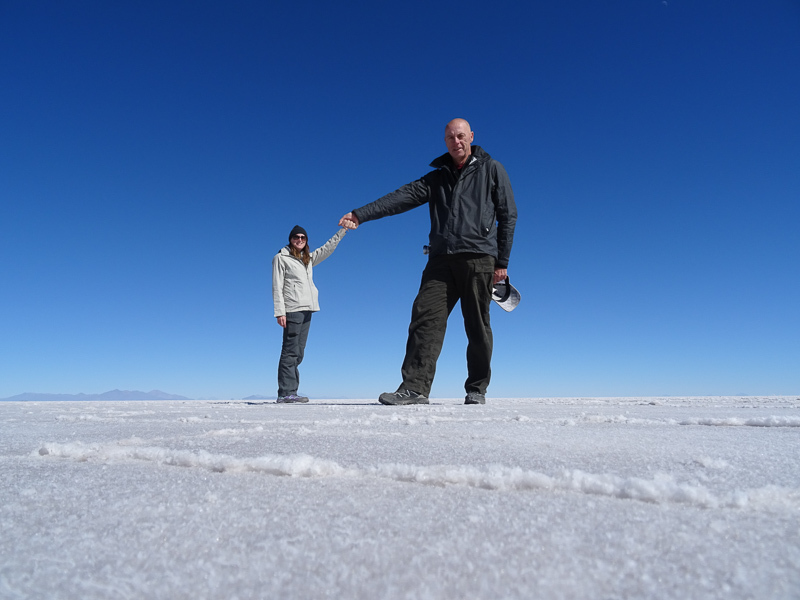 After two nights in Tupiza, it was time for our tour of the Salar de Uyuni. 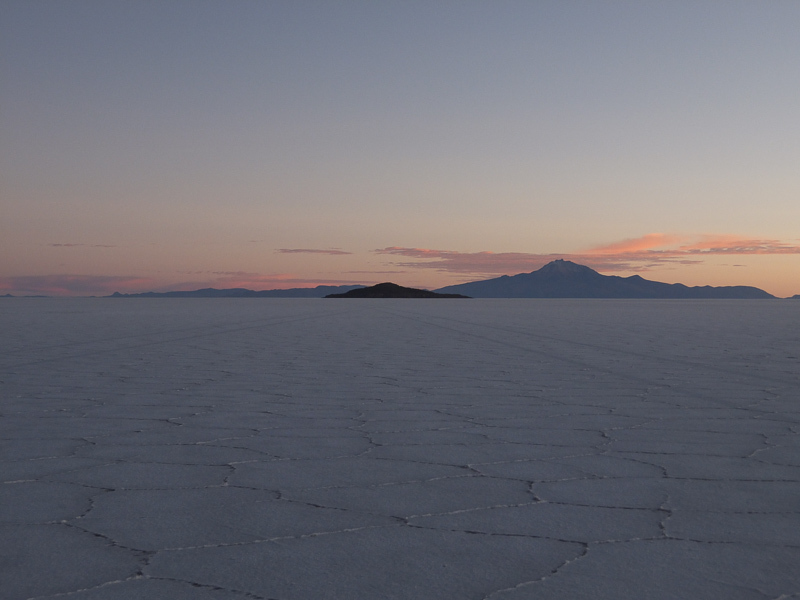 These salt flats are the world's largest. 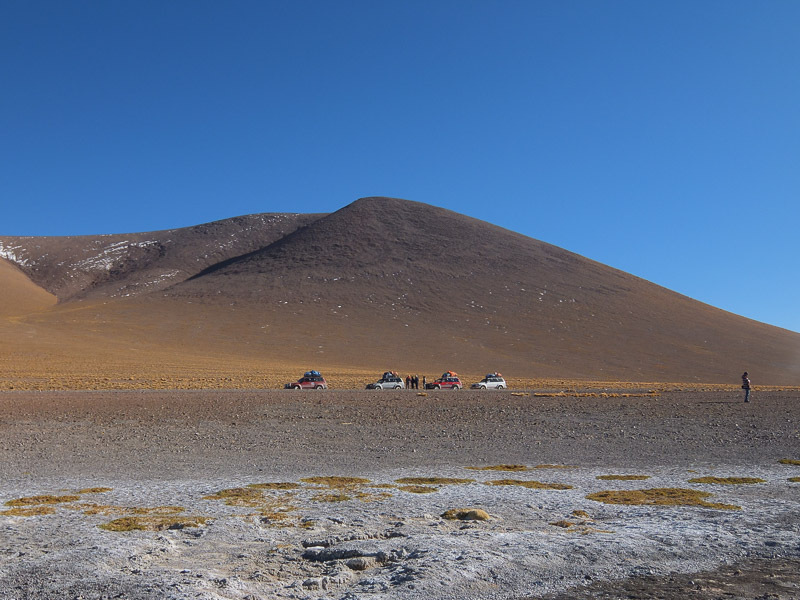 At over 10,500 square kilometres and sitting at an altitude of3,656 metres (nearly 12,000 feet). Want to know where your batteries come from? 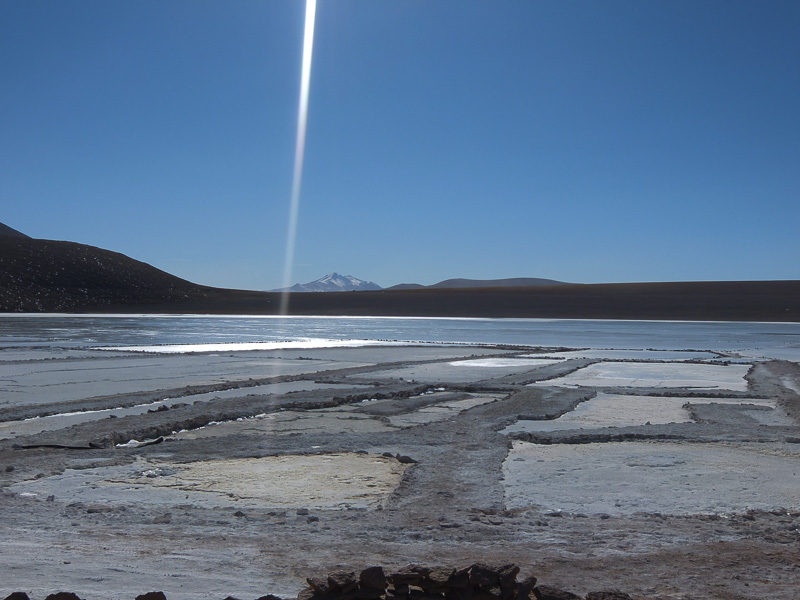 Well, this region contains between 50-70% of the world's lithium. Should have no problem getting the iPhone to last for 4 days then, yeah right. 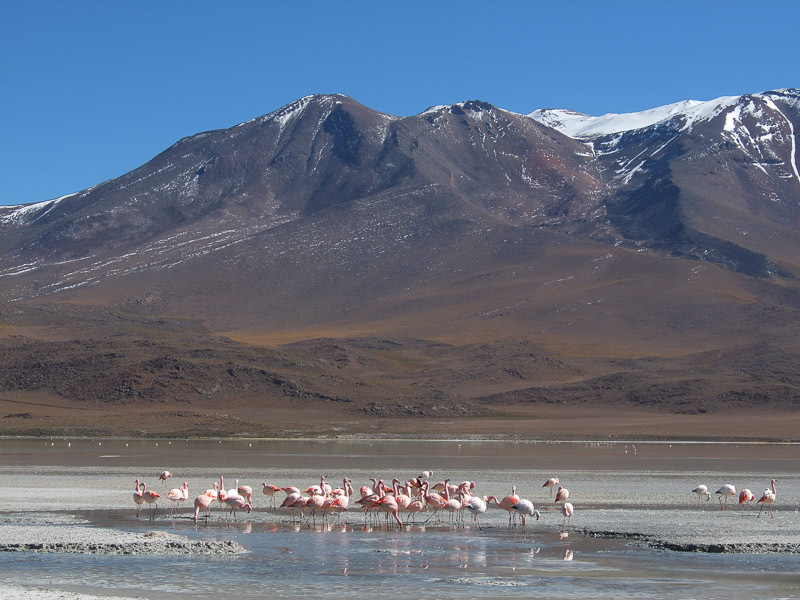 We booked with La Torre Tours, a four day, three night journey of the surrounding country, ending at the famous salt flats. 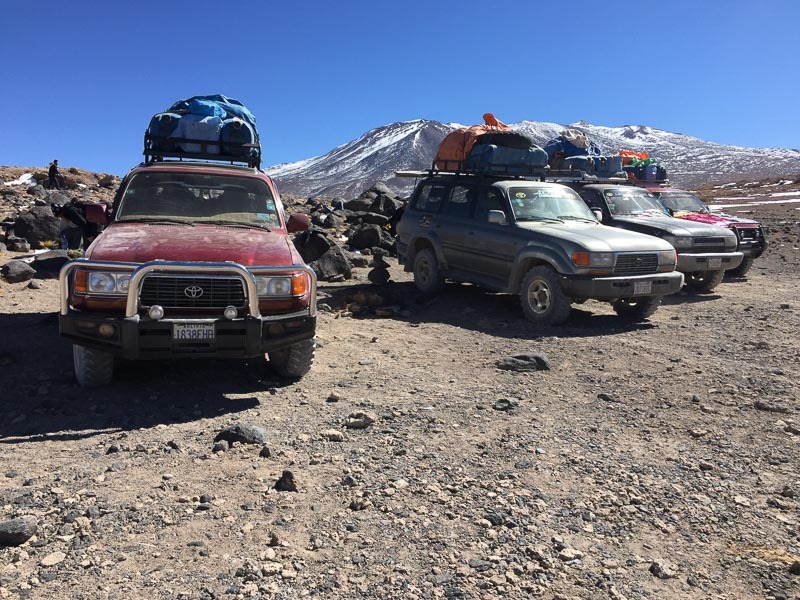 Our group of eight split across two jeeps (Toyota Land Cruisers). Complete with Hugo our driver and Reina our cook. In one car two Dutch couples, Nils & Lisa, Adrian & Maya. Our jeep buddies were Sarah and Lee from the UK. Lee had the faint trace of a Liverpool accent so the inevitable question had to be asked. Are you a BLUE or red? Turns out Lee was born just a stone's throw from Goodison Park, home to the world's greatest football team, EVERTON. And like me bled blue and white. The happy campers huddled up for warmth. Our first day was a long one, over ten hours in the jeep. 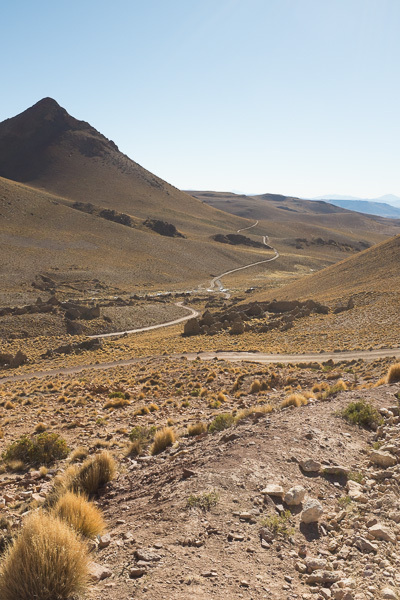 We also climbed more than a 1,000 metres to an altitude of over 4,600 metres. It's here that we started to feel the affects of the high elevation. It's like every sixth or seventh breath is missing and you struggle to fill your lungs. Other signs are a tightness in the centre of your forehead. Also any kind of movement feels like you have just finished a marathon. The surrounding countryside a mixture of desert and mountain passes. Every corner seemed to be another wow moment. We passed through several tiny villages before stopping for lunch. Whilst lunch was prepared we wandered the wee village. 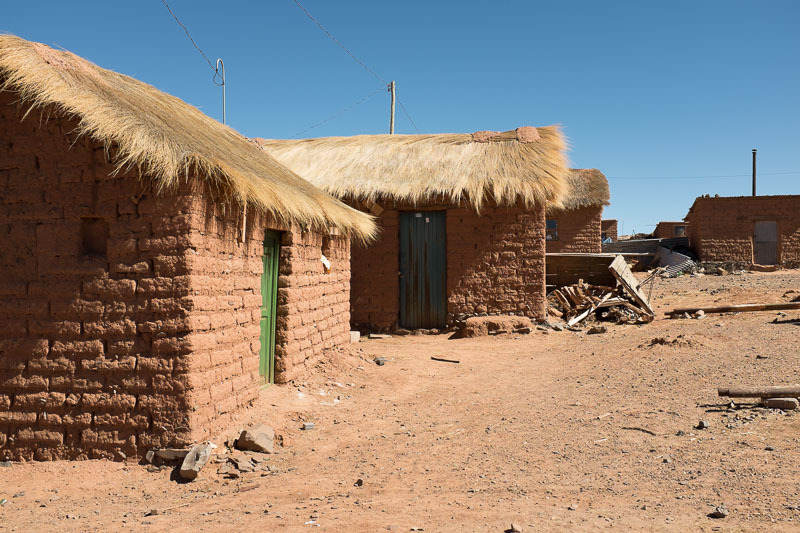 Just a collection of mud brick buildings and a baby donkey. We had been warned that the first night would be freezing and the accommodation basic. Turned out not to be too bad at all. If you know the song, 'Little Donkey', now is the time to sing. 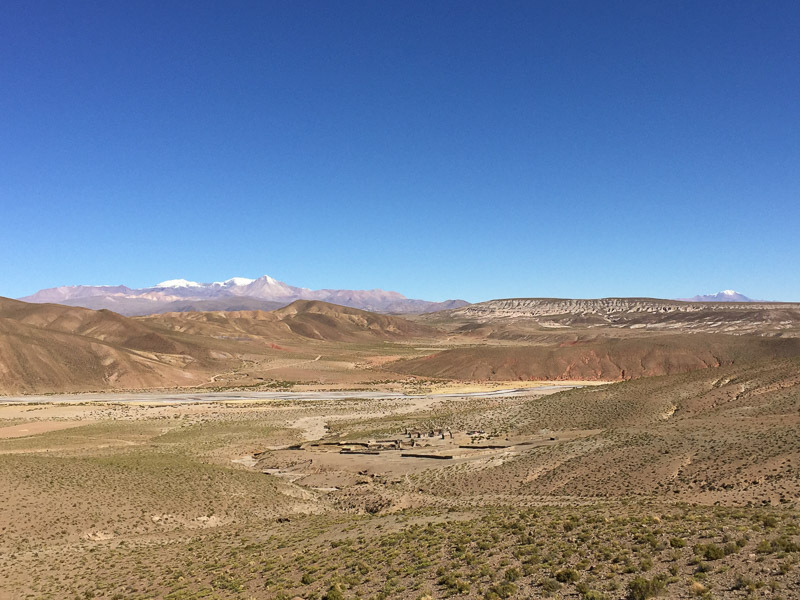 Stunning Bolivian landscapes everywhere you look. Day two started early, we were up and out at sunrise. The incredible landscapes continued to flash by. 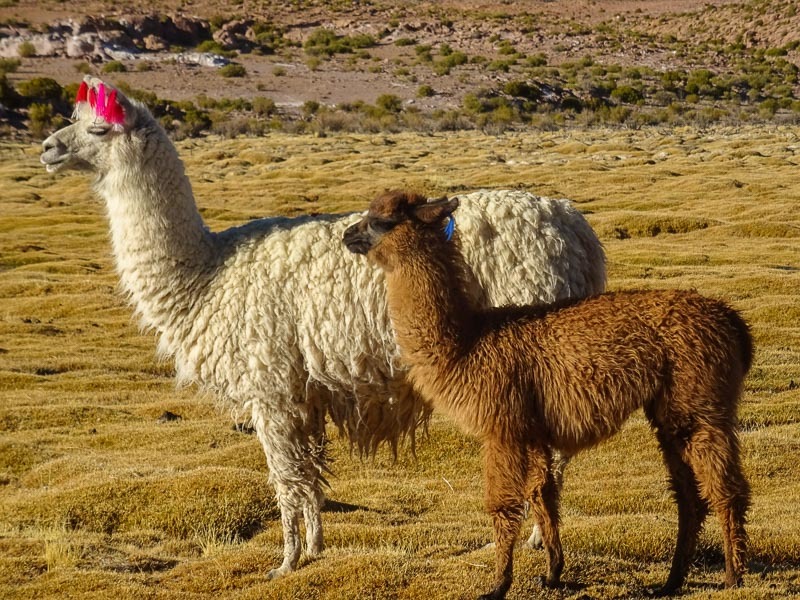 We stopped to take photos of a large group of llamas with their punk like ear adornments. 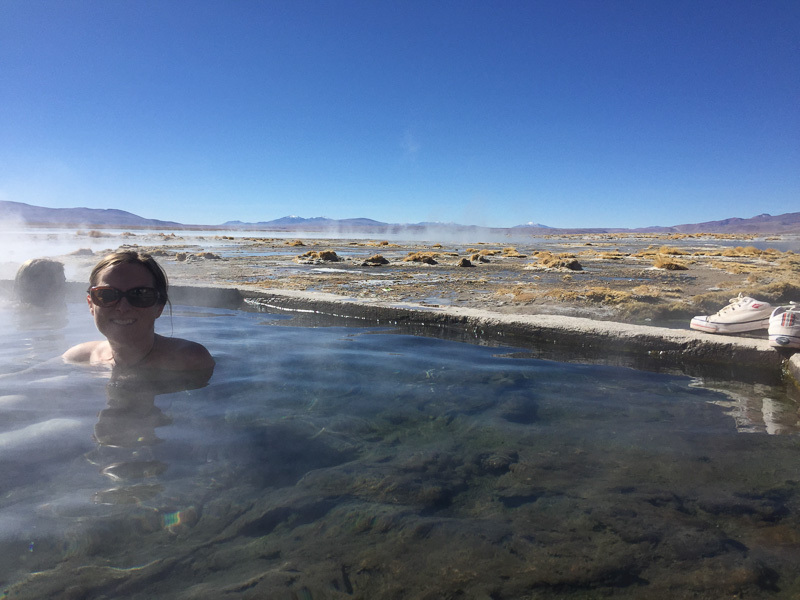 In the middle of nowhere there was the opportunity to jump into some hot springs bubbling away at 32 degrees. Not feeling too flash it was left to Julie to brave the elements between the changing room and pool. Just after the pools Hugo stopped to help another jeep. Well, Hugo stopped but it was Reina who had her head buried in the faulty engine. After twenty minutes with various other tour jeeps flashing by we heard the broken down car burst back into life. Way to go Reina. Relaxing hot pools in the middle of nowhere. Night two was the coldest either of us had ever been. Hugo informed us that it was likely to get down to -20 degrees outside. After dinner the eight of us played cards. A little tricky to shuffle when you have your llama gloves on. 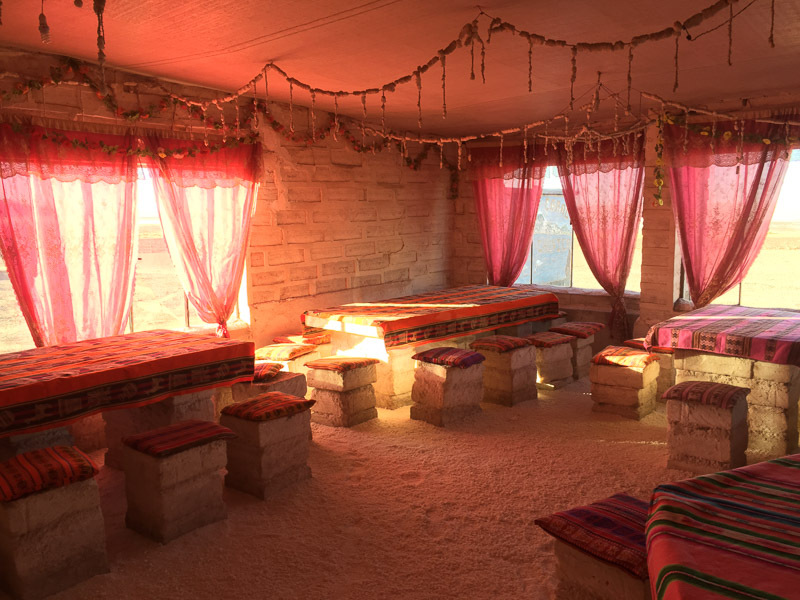 This accommodation had paper thin walls and forget any kind of heating. The several layers of clothing, Arctic sleeping bag and blankets didn't help us sleep. Day three. 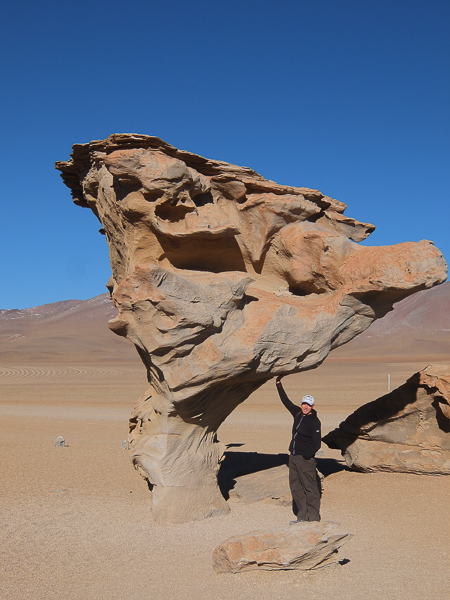 First stop Arbol Piedra, stone tree. A lonely rock that the wind had shaped into a tree. Then yet another stunning coloured lake caused by the minerals in the water. This one complete with three different types of flamingoes. Hugo found another great spot for lunch with a smoking volcano as a backdrop. Whilst we wandered around taking photos Reina prepared yet another stunning meal. By now Lee and I were onto our top Everton team of all time. Tonight's swanky digs was a salt hotel in Chuvica, yep everything made from salt. 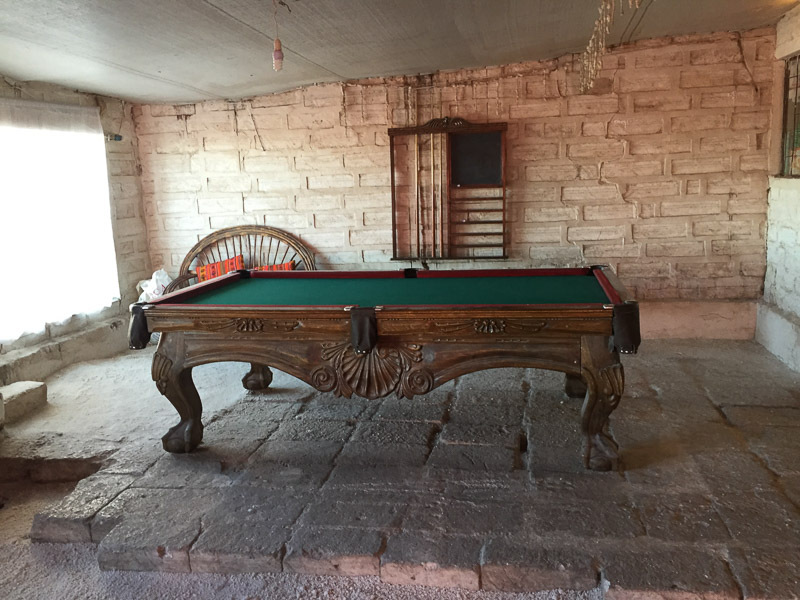 The walls, tables, chairs and the bed bases. 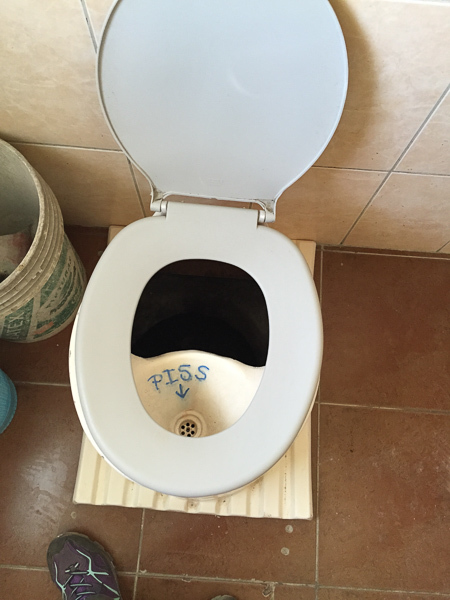 It was also the first opportunity for a shower in three days. Dinner was washed down with a bottle of red wine that helped send us off to sleep. Our final day started well before day break. We loaded up and headed out across the flat. We briefly stopped to take some photos of sunrise before arriving at Isla Incahuasi. A crazy 'island' standing tall over the flats covered in cactuses. Paying our entrance fee we wandered around for 30 minutes before returning to the jeep for breakfast. This time we were greeted by a heart shaped cake cooked by Reina. There were so many jeeps parked up it was like the starting line for the Dakar Rally. Speaking of which, the rally held a stage across the flats for the first time in 2014. 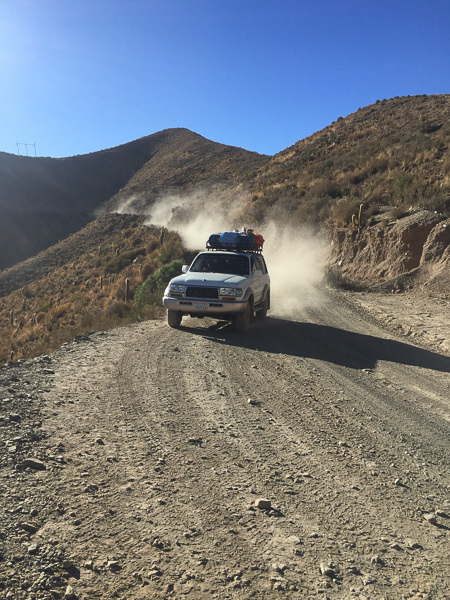 The start of the Dakar Rally, Bolivia style. 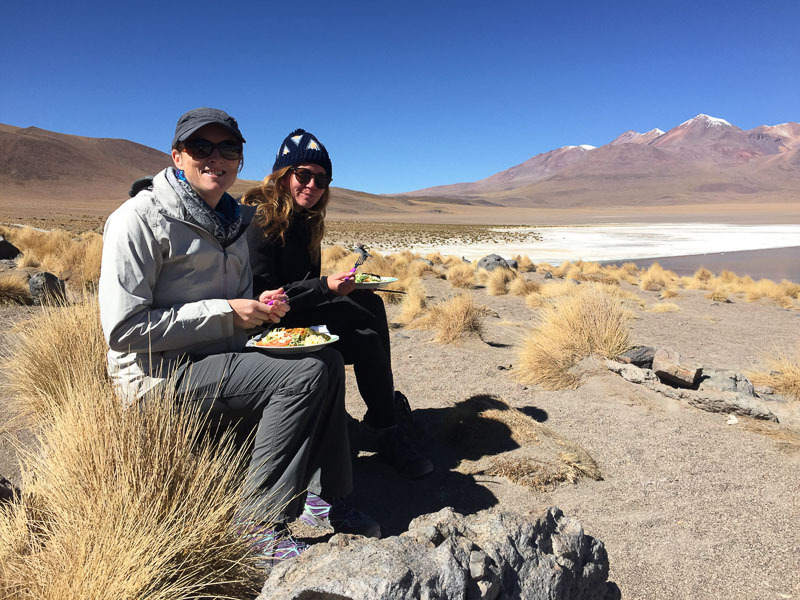 After breakfast we headed out onto the vast expanse of salt for crazy picture time. We were blown away with the hexagonal shaped ground. It was as if somebody had bought the biggest roll of kitchen lino ever. Given the nothingness of the flats you can take some funky perspective pictures. 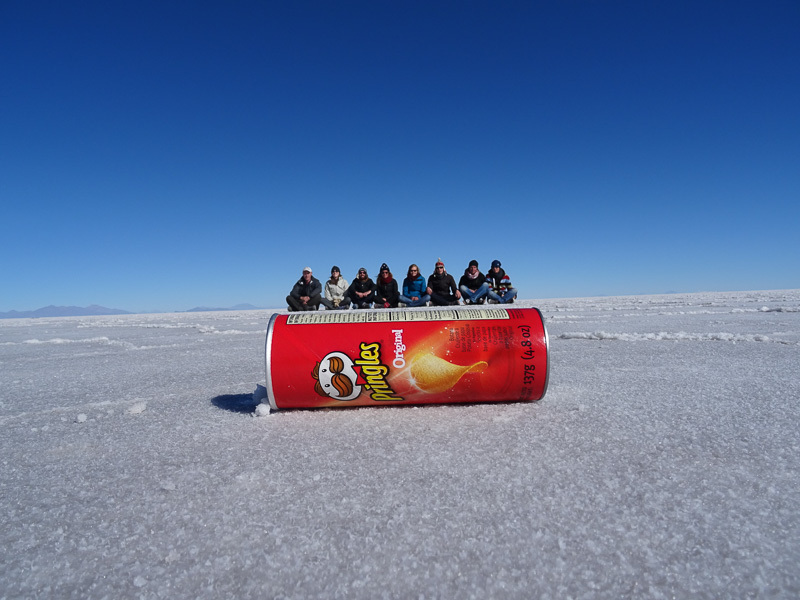 We rolled out the Pringles tube, guitar and frying pan for some great group photos. Hugo was a great photographer and knew exactly what would make us smile. 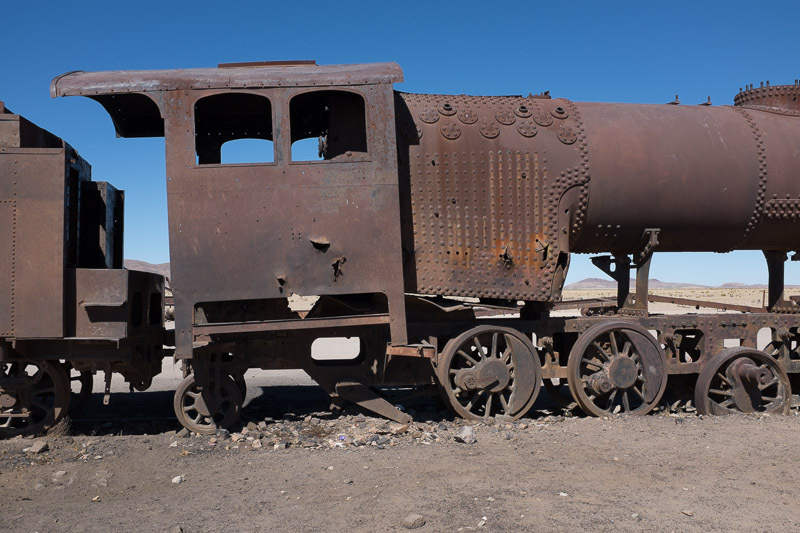 Our final stop on our tour was the train graveyard outside Uyuni. These trains used to haul the region's minerals to the port and larger towns. When the mining industry collapsed in the 1940's, the trains and tracks were abandoned. 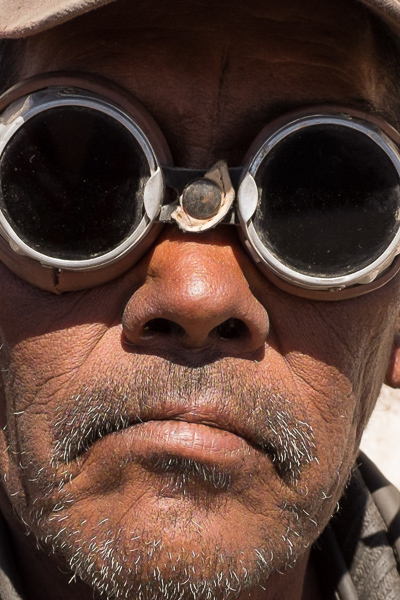 There must be millions of dollars worth of scrap metal that as now become a tourist attraction. 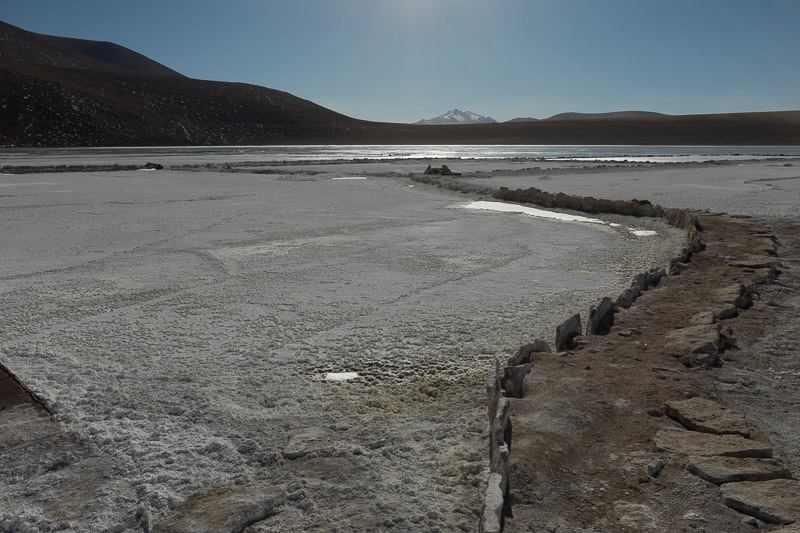 Now, Uyuni is like one big graveyard, not much happening here at all. It's home to the worse hostel we have stayed in so far. The bed had so much sag you needed a climbing rope to haul yourself out. The hot water that was supposed to be available between 4pm-8pm never materialised. To top it off Julie had to get up at 3.30am to answer the bloody doorbell that some drunk kept ringing. Did we mention it was FREEZING and the front door was across an outside courtyard? 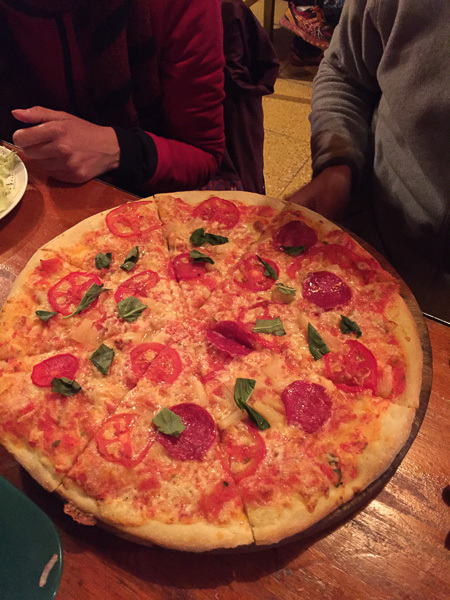 The only bright spot to Uyuni was the Minute Man pizza joint. 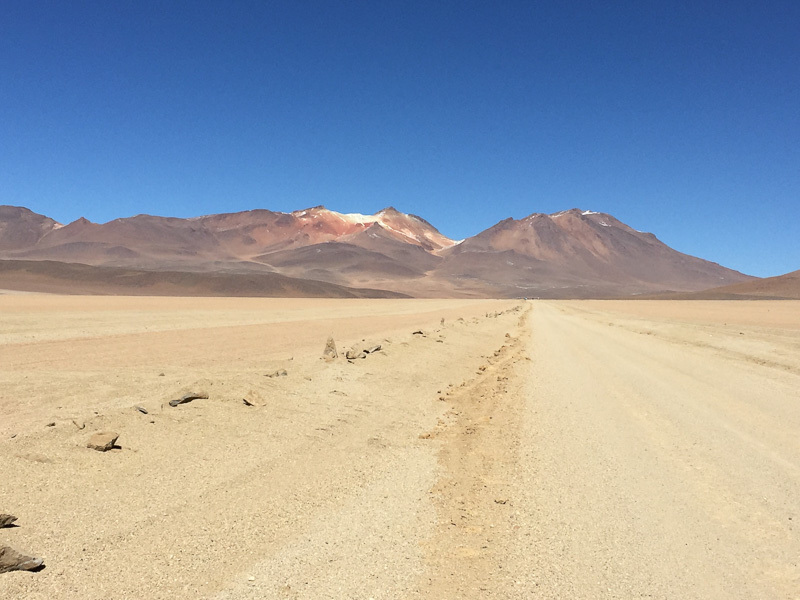 It was here that we said our goodbyes to a fantastic bunch of fellow salt flat buddies. 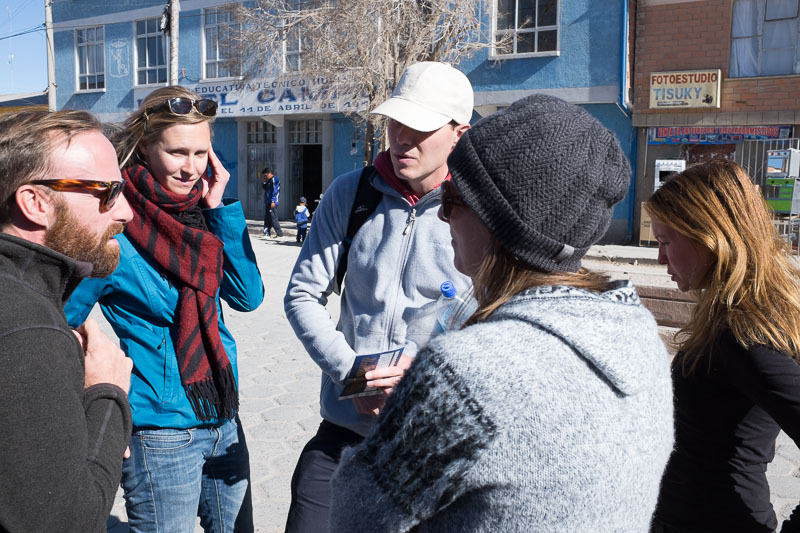 The following day we jumped on the first available bus to Sucre. 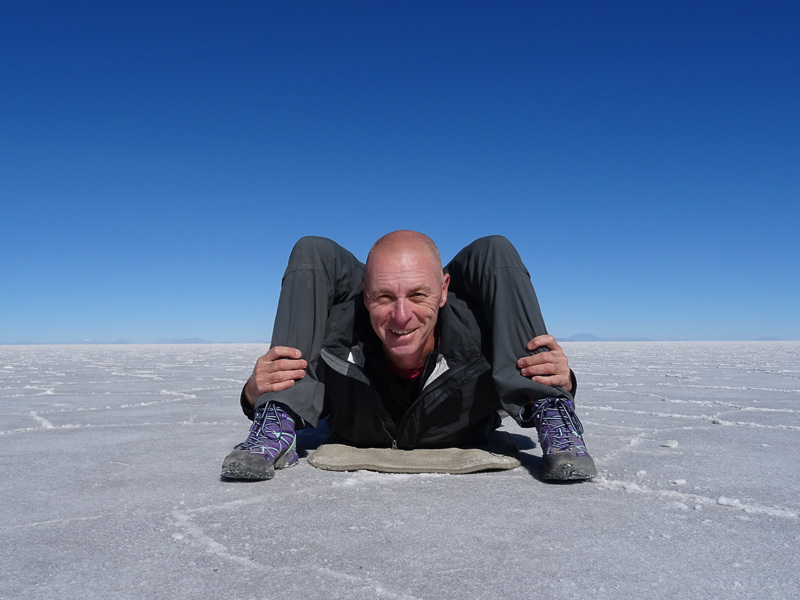 Pleased to be leaving the town of Uyuni behind us. 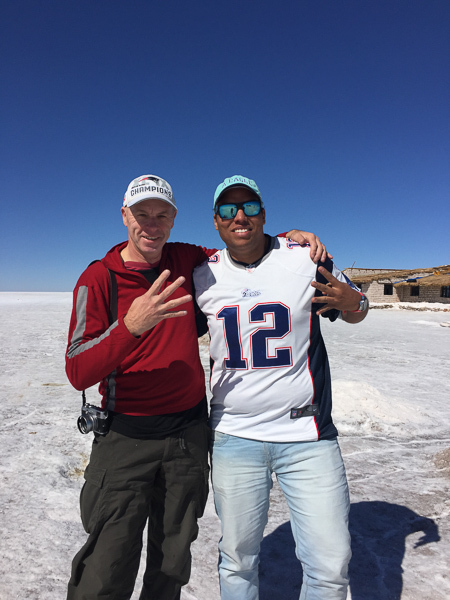 The salt flat tour was a blast. We were lucky to have a wonderful, careful and considerate driver in Hugo. A great cook with a gorgeous smile in Reina, who also knew her way round an engine. In Sarah and Lee, we couldn't have asked for better travel buddies. The tour and the tour company well exceeded our expectations. Day after day of stunning scenery rolled by. 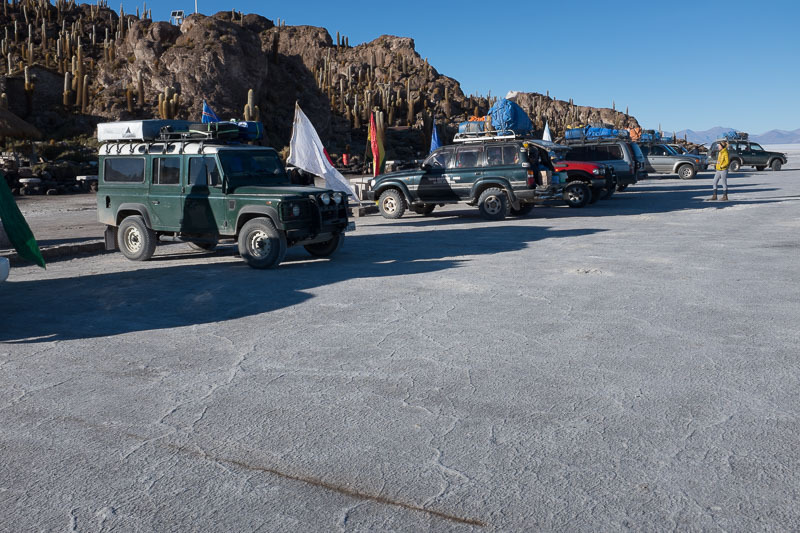 Arriving at the salt flats on the last day made all the time in the jeep so worthwhile. We highly recommend starting the tour in Tupiza. 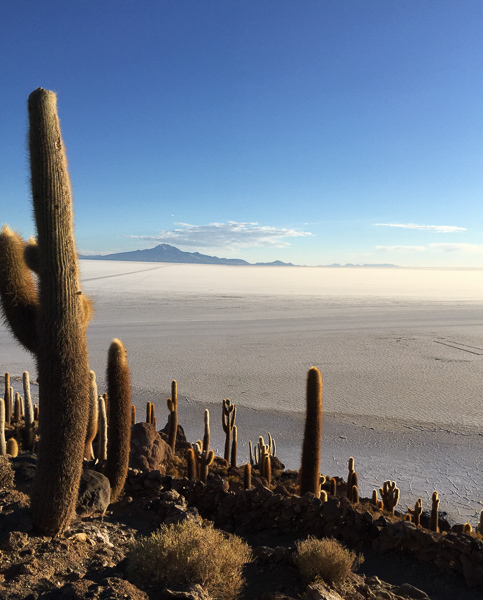 This whole region is a remarkable part of Bolivia. Some of the most amazing screnary. Next stop Sucre, for more Spanish School, and GOOOOOOOOOL!